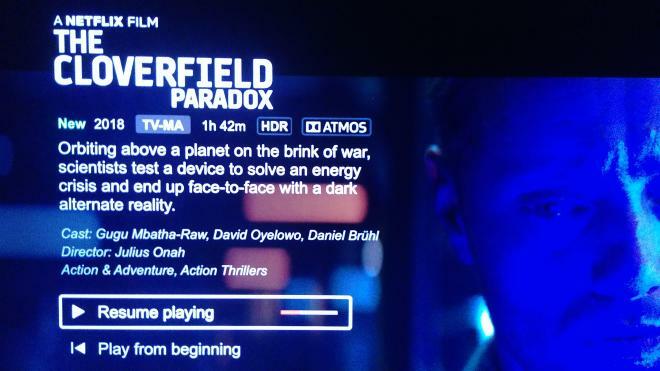 Netflix made a deal with Paramount for a sneaky release of The Cloverfield Paradox. Originally intended to have a theatrical release, it's difficult to know who got the short end of the stick on this deal. Paradox is a messy, convoluted piece of sci-fi hokum muddied by needless ties to a vague franchise. 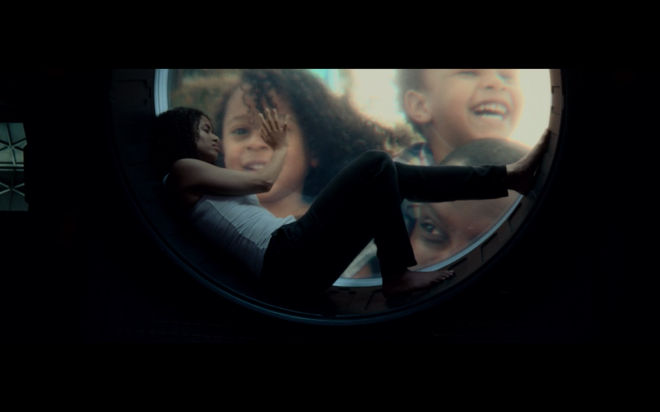 But hey, at least Gugu Mbatha-Raw and the rest of the cast deliver committed and impressive performances. Throw in great Dolby Vision and an impressive Dolby Atmos mix, and the film ultimately watchable, but far from a complete success. Worth a Look. Apologies for the confusion on our end (we had several TVs lie to us, which you can see below), but The Cloverfield Paradox appears to be the first HD streaming title released with Dolby Vision, HDR10, and Dolby Atmos capabilities, which is pretty fascinating for a whole bunch of other reasons. It's too late to move this review to a different page, so we'll leave it in our "Ultra HD" section since you technically still need a 4K display and 4K Netflix subscription to enjoy Dolby Vision or HDR10. This review is updated throughout. In the near future, energy is scarce. The oil wars have depleted the world's supply of guzzoline and Russia, the United States, China, Germany, and many of the other developed nations are on the brink of a catastrophic world war. But humanity has one last hope. Using a particle accelerator, there is a chance for the world to enjoy clean, infinite energy, but first, they need to get the damn thing working. Against fears that the device may rip open a hole in space-time and multiple dimensions, the experiments proceed on a space station orbiting the Earth where a crack crew of scientists have been trying and failing for two years to get the accelerator to fire. 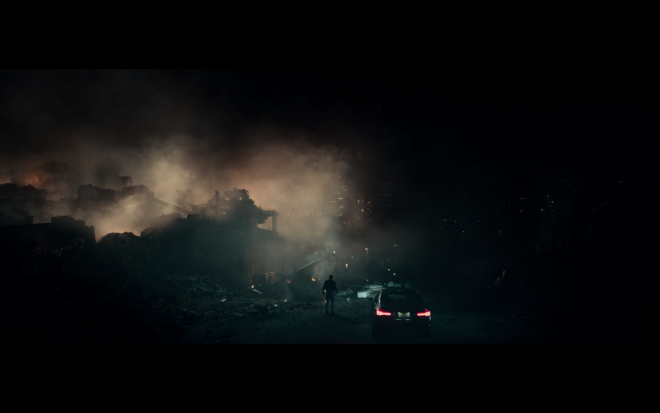 As the world teeters on the brink of tearing itself apart, Mission Commander Kiel (David Oyelowo), Hamilton (Gugu Mbatha-Raw), Schmidt (Daniel Brühl), Monk (John Ortiz), Mundy (Chris O'Dowd), Tam (Ziyi Zhang), and Volkov (Aksel Hennie). With only enough fuel for three more tries, the crew of the Sheppard finally succeeds. But when they try to report their success, Earth is no longer there. Spinning out into deep space, they must figure out what happened and find some way to get back home. Once upon a time in the long, long ago before there was ever an idea of an expanded Cloverfield cinematic universe, there was an interesting science fiction script circulating Hollywood called The God Particle about a crew on a space station testing new energy tech that sends them across the galaxy where weird things start to happen. Essentially that script boiled down to a B-movie simplified Interstellar with some crosses of Supernova, Event Horizon, and Lost in Space. Then 10 Cloverfield Lane became a surprise hit pseudo-sequel that was more of a terrifying domestic thriller than science fiction monster movie - but it worked. It made audiences want more. So as the story goes, The God Particle was snapped up, underwent some rewrites to accommodate the brand and became The Cloverfield Paradox. Ironically, the Paradox of this movie is that by taking what was described as a thoughtful, interesting sci-fi concept and melding it with a clever mystery-box styled franchise, the final product is an unfortunate mess that never feels like it's comfortable in its new skin. Where this film even remotely works is the terrific cast. With a distinctly international flavor, there is a nice realistic makeup of genders and nationalities that doesn't feel forced but instead feels realistic. These representatives of various countries are there because they are the chosen ones from the few nations capable of funding such an endeavor. Gugu Mbatha-Raw's Hamilton may the most rounded out and defined with a full arc to traverse, but the rest of the cast is committed and make the most of their roles. Ziyi Zhang is particularly a nice inclusion as she doesn't have to strictly speak in broken English throughout the movie. Enough of the crew apparently know Mandarin well enough that they easily understand her. It's those kinds of character touches that I wish the film had focused on instead of trying to also be a monster movie with weird inexplainable sci-fi gobbledygook tossed in at random. But then the "evil foreign crew member" trope starts rolling along and you start to lose hope that this film ever knew where it was going. Seriously, worms? I mean that was a gloriously gory sequence and I loved it, but why? And where did they go? Stuff just happens without rhyme or reason. It may be cool and kinda funny to see Chris O'Dowd's arm crawling around the ship on its own, but within the context of the film, it's silly and makes no sense other than it was a cool idea in the moment. There are a lot of cool ideas in the moment, but they never come together to make any genuine sense even in a sci-fi techno-babble BS way that works. If you start to think about the mechanics of this film, it begins to hurt after awhile. It's best to not think and just go with it. Put it simply, The Cloverfield Paradox never should have included Cloverfield or any of the references to giant monsters smashing cities. The Paradox would have been a perfectly decent title unto itself. Hell, considering the plot mechanics and the workings of the space station and its international crew, all they would have needed to do is toss in a lovable robot (or not) and this film could have served as the perfect pilot movie to that reboot Lost In Space television show that is set to come out later this year. If you go into The Cloverfield Paradox hankering for some B-movie sci-fi Cheez Whiz that simply provides diverting entertainment, you should make it out okay. If you're longing for a return to suspense-driven filmmaking that is built on simple but smart character development that also happens to be a sci-fi monster movie, this latest Cloverfield may leave you wishing the franchise ended in John Goodman's bunker. 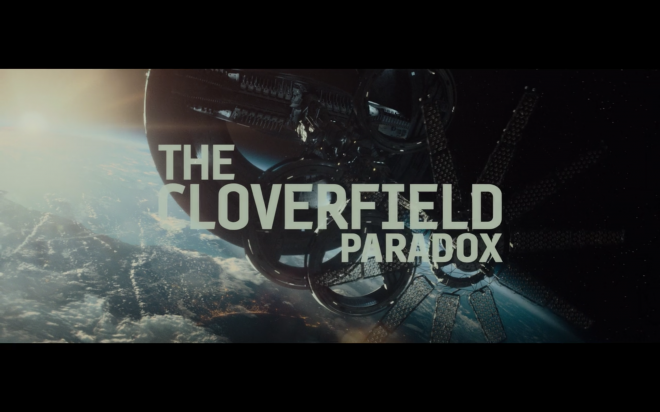 After a slick Super Bowl LII trailer, Netflix revealed The Cloverfield Paradox would be available to watch immediately after the game. For those with a fast enough internet connection, compatible gear, AND the appropriate Netflix plan, you can stream The Cloverfield Paradox in 1080p HD with Dolby Vision, HDR10, SDR and/or Dolby Atmos depending on your particular setup. --If you have a 4K Dolby Vision display, you should get 1080p HD + Dolby Vision + 5.1 audio. --If you have a 4K HDR10 display, you should get 1080p HD + HDR10 + 5.1 audio. 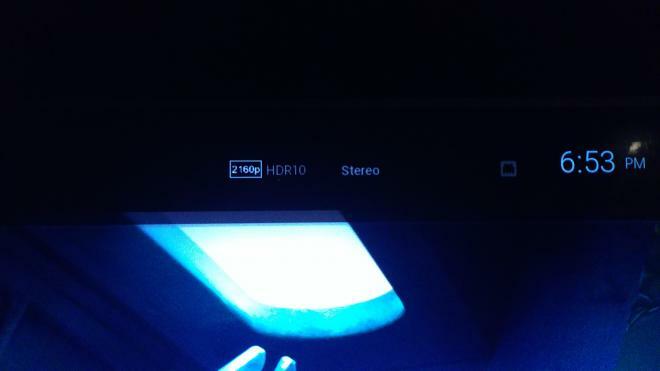 --If you have a 4K TV that lacks HDR, you should get 1080p HD + 5.1 audio. --If you own a 2017 LG OLED, you should get 1080p HD + Dolby Vision + Dolby Atmos. --If you own an Xbox One/S/X, you should get 1080p HD + HDR10 (or SDR) + Dolby Atmos. Thank God for Dolby Vision. Science Fiction movies offer filmmakers the opportunity to present unique and interesting visual universes. To put a specific finger on it, lighting - especially in space movies - offers up a terrific opportunity to give a film a sense of mood and place. I initially began my evaluation on my standard dynamic range 1080p display where I was struck by how garish and bright the movie looked. Almost like the cast had a flood lamp hanging over their heads. Obviously, this wasn't always the case, but the image didn't look like it enjoyed its shadows and natural visual atmosphere that can come from a long dark corridor where any sort of weird and terrible thing could be lurking. The imagery lacked depth. Switching over to Dolby Vision HDR (in what might be the first HD-only stream released with HDR capabilities), overall image quality improved greatly. Much stronger color separation and contrast. The image looked more organic than on my 1080p SDR display; where it had been too bright, I could now see more subtle grading, which rendered a deeper sense of dimension and space. Flesh tones also enjoyed more natural and healthy hues indicative of the international makeup of the case. As there are numerous blinking and flashing lights on this space station, primaries are terrific and emerge with a nice natural pop. The bright bold purple light of the accelerator is especially lovely with Dolby Vision. Black levels and contrast are also greatly improved. The star field gives a terrific sense of the infinite as the station spins out of control into deep space. However, the paradox (pun!) 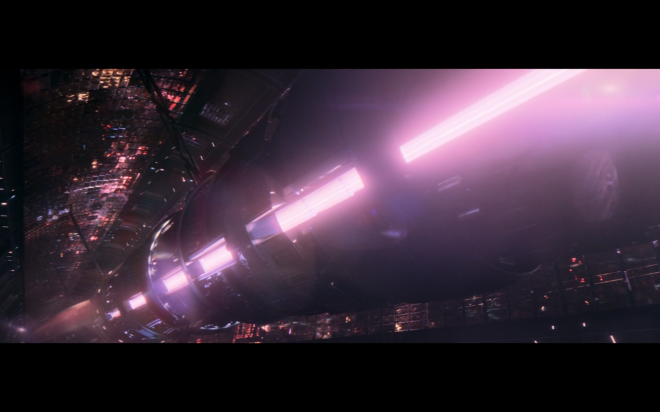 of added resolution and the Dolby Vision HDR push, some of the cheaper CGI effects look particularly clunky (some ship backgrounds look smeary and edgeless while some digital makeup effects look outright goofy). The scenes where Roger Davies Michael drives around witnessing the vast destruction is a notable example of how resolution and HDR betray poorly-rendered CGI. The final twist before the film crashes to the credits is particularly goofy and cartoonish looking. All around I would say this is a solid presentation from Netflix, but my scales obviously tip in favor of Dolby Vision. 2/7/18 UPDATE & EDITOR'S NOTE: As you can see below, our 4K VIZIO P75 display said it was receiving a 2160p signal from the Xbox One X which, in retrospect, is probably related to the One X's built-in video upscaling. Our VIZIO and LG displays also seemed to think we were getting 4K rather than HD, but at this point, who knows. As noted above, per Netflix, this is an HD-only stream even though Dolby Vision, HDR(10), and Dolby Atmos are also options. I think the takeaway from this confusion and Netflix's resolution choice is that HDR (all forms) remains resolution agnostic. Given how many movies are still finished in 2K, it's a shame that studios and TV manufacturers are pushing everyone to 4K (Must Own!!!) when they could have dramatically improved HD Blu-rays and streaming services with the HDR, wide color, and more efficient video codecs we see in the Ultra HD formats. That said, most of the 4K displays I've reviewed or demoed outperform the best HD models. Please note: This portion of the review and the review's audio score has been updated to reflect the Dolby Atmos soundtrack available for those with an Xbox One/S/X or a 2017 LG OLED. The original 5.1 review remains below. For a streaming movie, The Cloverfield Paradox Dolby Atmos soundtrack is surprisingly impressive. With the added height channels, the score and various other background activity are able to move freely across the soundstage, creating a very broad and expansive half-dome wall of sound that's fairly consistent. The pings and bleeps of the computer systems surrounding the characters convincingly pulse and ring off-screen while Bear McCreary's music exhibits excellent warmth and fidelity. There is also the occasional burst of cracks, pops and loud thumps that reverberate through the long hallways of the space station, which spread to the sides, surrounds and overheads with effective directionality. Back on Earth, the screeching of emergency sirens fluidly pans from the front to the back and from side to side with a shocking sense of realism, not only surrounding Ava's husband, Michael, but fully immersing the listener as well into that sense of panic and urgency. Many of those same atmospherics also travel into the ceiling channels with impressive discreteness or echo with incredible authenticity. And for an added bonus, an improvement over the 5.1 Dolby Digital Plus version available to most Netflix subscribers, the LFE is far more palpable and shockingly authoritative, pushing certain action sequences into the low-20Hz depths and hitting the room with a couch-shaking, wall-rattling impact that terrifically expands the object-based lossless mix. I really wish Netflix would support Dolby Atmos on more devices. Yes, Xbox One & 2017 LG OLED owners can enjoy Atmos on The Cloverfield Paradox and a growing-but-small selection of titles, but far too many of us are needlessly stuck with 5.1 Dolby Digital Plus. Which is fine when you're in a pinch, but after the evocative 10 Cloverfiled Lane Atmos mix, The Cloverfield Paradox in 5.1 sounds underwhelming and far less immersive despite the film's grander settings. Back to the 5.1 mix. Dialogue is fine, but with the assortment of voices and distinct accents I had to keep my volume higher just so I could understand everyone. Sound effects are solid enough and there is enough surround activity to keep the channels moving. Composer Bear McCreary returns to the JJ-verse with another moody and effective score, but there are times where there is just so much happening that elements don't really separate. However, there are a few standout moments -- a spacewalk sequence and a scene where a crew member is trapped in a compartment flooding with water -- where the mix gets pretty exciting auditory experiences. That said, I wish Netflix would expand its Dolby Atmos capabilities to more devices and more movies (or even offer lossless, though that's farm more likely). Overall, the 5.1 mix gets the job done. Not bad, not great. The Dolby Atmos mix is WAY better. What a shame Netflix won't support the format on more devices (looking at you, Apple TV). I was really looking forward to the mysterious third Cloverfield movie. I loved the spin Cloverfield gave the giant monster movie by twisting into the found footage sub-genre. I loved how 10 Cloverfield Lane created a tight and tense domestic nightmare evocative of Night of the Living Dead where the company you keep can be as dangerous as the monsters outside your door. 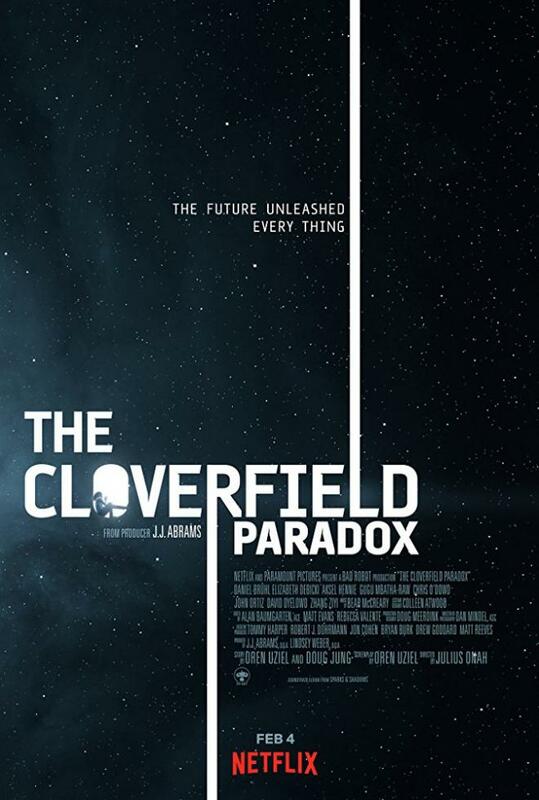 But The Cloverfield Paradox… well… I didn't like it. I wanted to. I enjoyed the mystery-box the first two films flirted with. I was excited when I saw that commercial come up that later that evening if I wasn't wiped out I could stay up and watch it. Unfortunately, that trailer and release reveal is little more than a stunt backed by a movie that can't support the weight. Had this omitted the ties to giant monsters and was content to be its own thing, this film could have been something. But the clunky plot mechanics, silly script, and the obvious late addition ties to the franchise keep this movie from living up to its namesake. If you love cheap B-movie sci-fi hokum, it's a fun ride, but if you're looking for genuine thrills and chills, be thankful you didn't pay full price on opening day. Now with reports that the fourth film has already finished filming, I'm worried this franchise is banking on being clever rather than smart. Thankfully this flick looks great in Dolby Vision and boasts an immersive Dolby Atmos sound mix (for those with the right equipment). The more-readily-available 5.1 audio stream is less immersive, but gets the job done. At the end of the day, The Cloverfield Paradox is at least worth a look, but don't expect too much from it. Or check out other recent discussions.